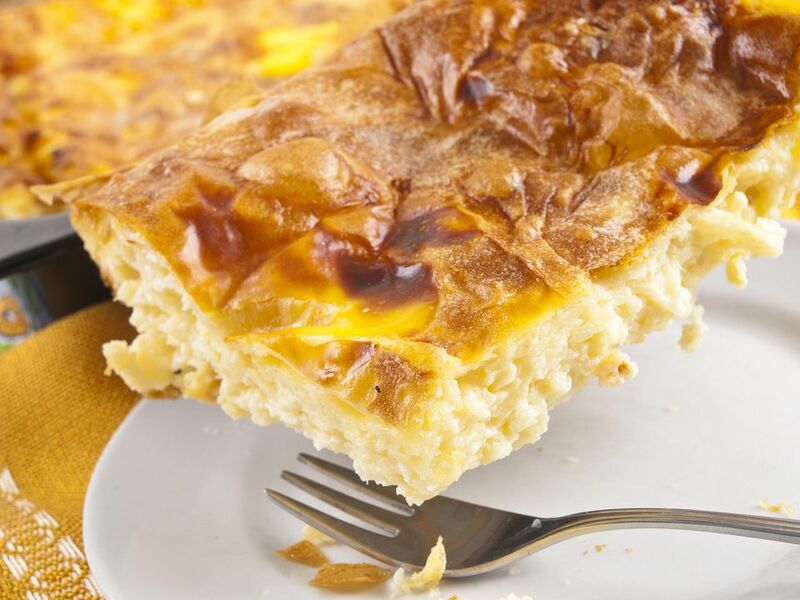 Make this excellent breakfast casserole recipe for a filo sausage egg bake the night before you want to serve it, or freeze for longer storage. It bakes up crisp, brown, savory and delicious in 50 to 60 minutes. In a large skillet, melt 1 tablespoon butter and olive oil over medium heat. Sauté red pepper, onion, mushrooms, and green bell pepper until tender. Remove from skillet and set aside. In the same skillet, brown sausage until cooked through and no longer pink. Drain and mix with mushroom mixture in skillet. In a medium bowl, beat 4 eggs well. Stir into the sausage and vegetable mixture in skillet; cook and stir over medium heat until eggs are set, about 5 to 6 minutes. Add Havarti cheese; remove from heat and let cool for 20 to 30 minutes. In another medium bowl, combine spinach, ricotta cheese, softened cream cheese, 1 egg, Parmesan cheese, basil, and thyme. Unroll filo sheets and cover with plastic wrap and damp paper towel. Place one sheet in a 13 by 9 inch glass baking dish. Brush with some of the melted butter. Add seven additional filo sheets, brushing each with butter. Spread half of mushroom/sausage mixture over dough. Layer and brush with butter eight more sheets filo dough. Spread with all of spinach/ricotta mixture. Layer and brush with butter four more sheets filo dough. Top with remaining mushroom/sausage mixture. Layer remaining four filo sheets on top, brushing each with butter. Score top of filo dough in a diamond shape. Cover tightly and refrigerate for 2 to 24 hours or wrap well, and freeze up to 3 months. If refrigerated, uncover and bake at 350 F for 50 to 60 minutes or until puffed and golden brown. If frozen, thaw overnight in ​the refrigerator, then bake uncovered at 350 F for 60 to 75 minutes until puffed and golden brown.